We here at the Prairie House love grey. Almost every room has a splash/wall/accent of grey. It highlights the teak trim and panelling well and instantly modernizes the original elements that seemed dated against the existing nicotine yellow colour. We had three desperate areas requiring painting left in the house: the kitchen (nicotine cream with wallpaper); the hallway (6 layers of wallpaper over flamingo pink and jail cell brown); and the upstairs bathroom (sage green - with pink fixtures - this one kills my soul). Alas, the bathroom cannot be tackled until the reno in the late summer?/fall? The hallway has been Jason's albatross. While we originally thought it would be a good idea to remove the layers of wallpaper it took him 5 whole months of scraping (didn't work), every recommended wallpaper remover in Calgary (nope), this cutty thing that put holes in wallpaper to allow water to soak through (ok but ssslllllooooowww), and finally a rented wallpaper remover (MESSY but effective) to remove the wallpaper. Then, during what I found out through first hand experience to be Calgary's monsoon season, he had to patch and sand, taping up every entryway with plastic, ET style. Try entertaining two kids for 6 hours when it's dumping rain, hail the size of golf balls, cracking fork lightening with a splash of tornado warnings. Good times. After all said and done, every stage just made the hallway look worse. 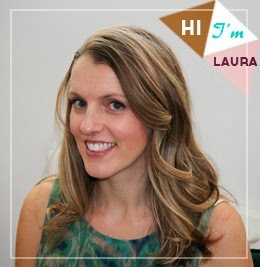 So we hired Janet to pretty 'er up. 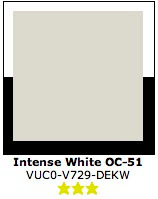 I had originally selected a very light shade of grey called Intense White, (neither white nor intense) from Benjamin Moore*. Design challenge #62 was to retain the original faux concrete block on the bottom half and make it look more modern. So I figured it best to paint out the entire wall in this light grey. Well, after Janet finished one coat on the entire hallway (and it's a big hallway), I didn't like it. The faux concrete block on the base looked too stark, too much like primer, and it appeared as though it was floating. So I was forced to do something I swore I would never do. Change my mind. 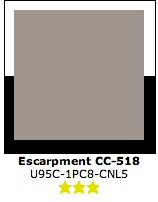 Hubby and I decided on a darker, creamy grey called Escarpment,also from BM, which has a touch of a purple undertone. Janet, while clearly not impressed, was very obliging. This colour works well with the other greys in the house and really helped to ground the wall. Lily, who loves to just hang around and chat to contractors, told her that she thought it looked exactly the same as it was before. Janet told her not to tell her mom that. ha ha. Anyways - here's the final results. While we used the same tones of colours (light on top, dark on the bottom), I am very happy with the end result. As a final touch, we will be adding a small wooden chair rail painted out in the same colour as the upper portion of the wall. The second type of wallpaper. The original owners just recovered this paper/paint stamped wallpaper over and over and over and over again. Paper wallpaper is NOT easy to remove. Rented wallpaper remover is the best option. 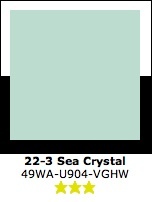 Here's the original wall colour - Carnation by Pittsburgh Paints. Imagine this wall, but covered in scrape marks, remnant bits of wallpaper and drips marks from wallpaper removal. Then imagine living with this for 5 MONTHS!! AFTER - well not quite. But thought I'd show the wall before the base was painted out a darker grey (upstairs). The ceiling patterning is exquisite. Will show you in detail once I get my frickin' camera back. As I mentioned, Janet also painted our kitchen, which looks absolutely divine. I would show you pictures but hubby is currently on a Shaw sponsored "event" at the Eagle Point Fishing Lodge, near Prince Rupert, BC and has the camera. He and a selected few took the private Shaw jet up there. I told him that a private jet wasn't the most eco friendly option. He told me to put a cork in it. In lieu of some gorgeous shots of the 'After', here are the paint chips. 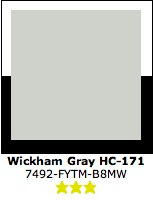 As a reminder, we painted the walls in the Wickham Gray (Benjamin Moore) and the ceiling in a slightly lighter shade of Sea Crystal (Pratt & Lambert). Coming up - The downstairs bathroom!! *Paint chips from Colorcharts.org - which I find to be the most authentic colours for your computer. I use this website for historic colour analyses at my office. I knew thats very difficult to successfully reduce the new paint odor when you paint indoors. But after reading this whole post its very easy to reduce the new paint odor. Thank you!